I think your ideal home says a lot about you. If the world were your oyster, would you go for something Victorian, Georgian, a duplex apartment, new build house, or maybe a farm? I have to say, my choice would probably be Georgian, there's just something about the windows! I just want to go in, tuck myself up on a couch with a book and a fire roaring in the background and look out of a lovely sash window, perhaps at snow falling down. However, given that we live in Banstead our choices are somewhat limited by what we have and don't have and sadly (for me) Georgian homes are lacking around here, but what are the hottest types of property and what does this mean for sellers? The time it takes to sell your home depends on three principal things; price, condition and location. Price is the most important factor, especially now in a more cautious market, and where you set it will directly affect how long your home takes to sell. It is therefore worth being aware of reasonably significant differences in average time-to-sell across the country so you can manage your expectations. For example, data released by Post Office Money showed that the average time on the market in Bristol is currently 61 days compared with 77 days in Leeds, 84 days in Brighton and 111 days in London. In Banstead & Nork, the most common type of property is a 4+ bed house. In fact, a whopping 48.5 per cent of all families in the area live in such a home. We see a lot of this kind of property come onto the market, but more compact homes are also in high demand, particularly in more central areas. One of the best things about our area is the broad variety of homebuyers all looking for their own perfect next home. We know the most common type of property in Banstead & Nork, but which kind of home changes hands most often? The Land Registry does not tell us the bedroom count of homes that have sold, so we only know whether they were flats, terraces, semis or detached homes. As such, we can see that it is detached homes which transact most frequently. 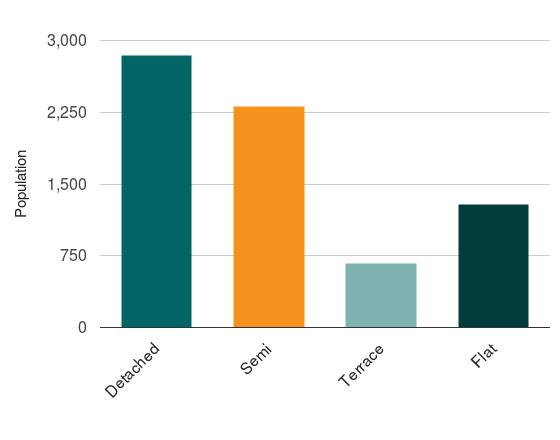 So we know that detached homes are sold most often in Banstead & Nork but most families live in a 4+ bed house. In reality, we have a vast cross-section of homebuyers always looking for the perfect next home. If you are looking for someone who understands the market to help ensure you get the optimum price when you come to sell, please get in touch with us by giving us a ring on 01737 887 674 or emailing greetings@sachascott.com. 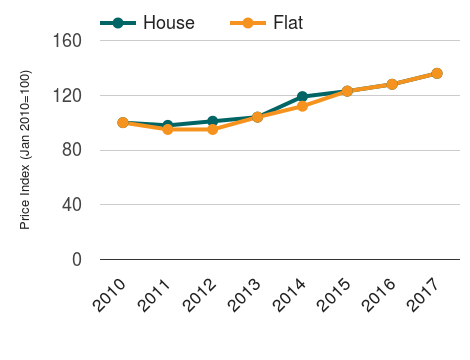 We've included this chart to show the relative number of flats and houses selling in the last 11 months in our area. 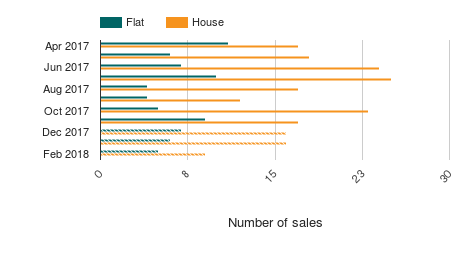 Due to the profile of the housing stock in the area, there's nothing too surprising here, but it's interesting to see how the different types of properties contribute to total sales levels. Source: ResiAnalytics, Office for National Statistics and Land Registry © Crown copyright 2016. Note: Dotted lines or hatched areas on charts indicate estimates based on historical patterns.